The Auschwitz-Birkenau Memorial and Museum, located in Oświęcim, Poland, on the site of two WWII Nazi concentration camps, has launched a page on the social networking site Facebook. Since its launch a few days ago the memorial’s page has seen a flurry of activity, with over 4,400 people becoming “fans” so far and constant posts and comments. Most people have expressed their support for the page, and many messages of “never again” have been posted. 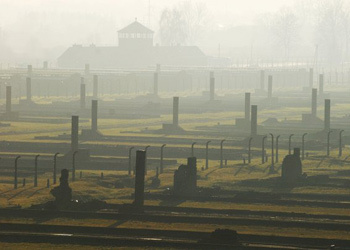 Over a million people, mostly Jews, perished at Auschwitz-Birkenau during WWII, and the camp has become one of the main symbols of the Holocaust. The Auschwitz-Birkenau Memorial and Museum decided to put up the Facebook page as an educational tool to spread knowledge about the Holocaust and promote its memory. Paweł Sawicki, a spokesman for the Auschwitz Memorial, told the Associated Press that the Facebook page is a “kind of experiment”. “Facebook is a tool that young people are using to communicate, so if we want to reach them, we should be using their tool,” said Sawicki, who was quite surprised by the immediately large interest the page attracted. The Auschwitz Memorial Facebook page also brought up the question of weather Facebook is an appropriate place to address the Holocaust. Piotr Kadlcik, a leading member of Poland’s Jewish community, told the AP that he doesn’t think Facebook is the “worst place for education,” and that “the world has changed”. “Facebook can be such a place, and I don’t see anything dangerous or wrong about the Auschwitz Museum having a profile on it,” he added. The issue of Holocaust deniers has been brought up as well, but so far there have been no malicious comments on the page. Sawicki said that if such comments do show up, they will quickly be removed. He also said that it is a “waste of time” to attempt to convince such a small group of people about the Holocaust. The Memorial’s page includes comments, discussions, historical information about the Holocaust and Auschwitz-Birkenau, and practical information about visiting the museum. There has been a lively exchange of information between users, including a Holocaust survivor’s son sharing his family’s story. The photos section includes a gripping art exhibition by Marian Kołodziej, an Auschwitz survivor. Visitors can also read an interview with Kołodziej, who passed away earlier this week. The Facebook page informs users that his exhibition is located at the Franciscan Convent in Oświęcim. The “become a fan” button on Facebook has also received a lot of attention from the page’s visitors. Those interested in joining the page and posting their comments must “become a fan.” Some believe it is an awkward phrase and attempts to have it changed have so far been unsuccessful. The Auschwitz-Birkenau Memorial and Museum receives about one million visitors every year. ← World Cup Special: Poland Out, But Who’s In?